Social Media Statistics is the most important aspect that a Social Media Marketer looks for. Social Media Users Statistics broadcasts how frequently people are using social media networks and what social media platform is most used for personal use or branding purpose. Also you can analyze which is the best social media for business. The biggest concern of every social media marketer is the varying popularity of varied social media platforms. The most popular social media platform of 2017 may no longer be the most popular in 2018. To ease your work of analyzing the social media statistics we have put together social media stats, which can be profitable for you to analyze the social media market. Total social media users as of now are 3.196 billions, which is 13% more than that of users from last year. Total number of people using social media via their smart phone is 5.14 billion, 4% higher when compared to 2017. On the whole it is 11 new people who start using social media at every second. The average American spends over 2 hours per day on social media. The Southern and Central Asia have the fastest growing market for social media. Total of 3 billion of people worldwide use social media at least once a month. 88% of social media users are of age in between 18 to 29 years. 51% of users of age 18 to 24 say that it is hard to not to use social media. It is estimated that by 2019, social media spending only by United States would be around $17.34 billion. 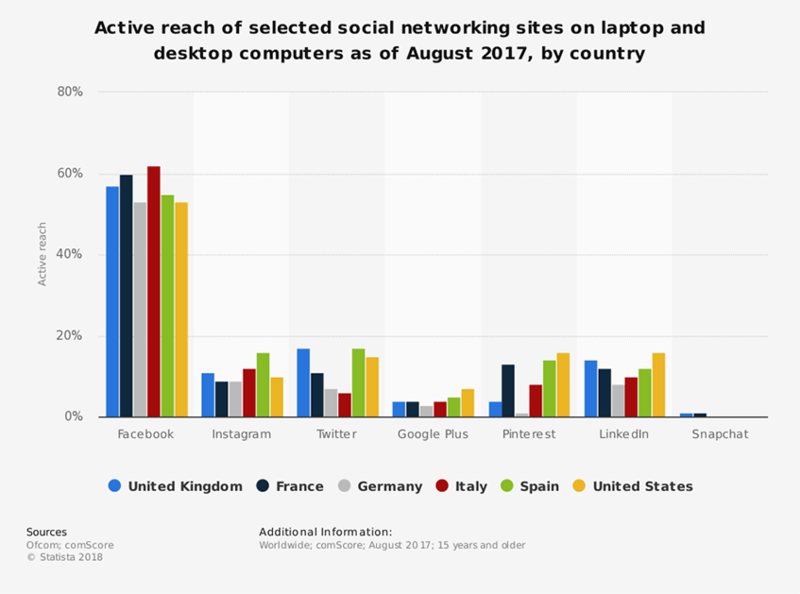 Below is the statistics displaying active reach of popular social media platforms on laptop and desktop as of August 2017, by country. Total number of Facebook users has grown up to 15% over years, with more than 2.17 billion users at the beginning of 2018. Total number of teenagers using facebook has increased up to only 5%, where as number of users aged 65 and more has improved by 20% over the years. 88% of facebook users access their account via their phone. 56% of facebook users and male and 44% are females. 74% of facebook users access their account on daily basis. 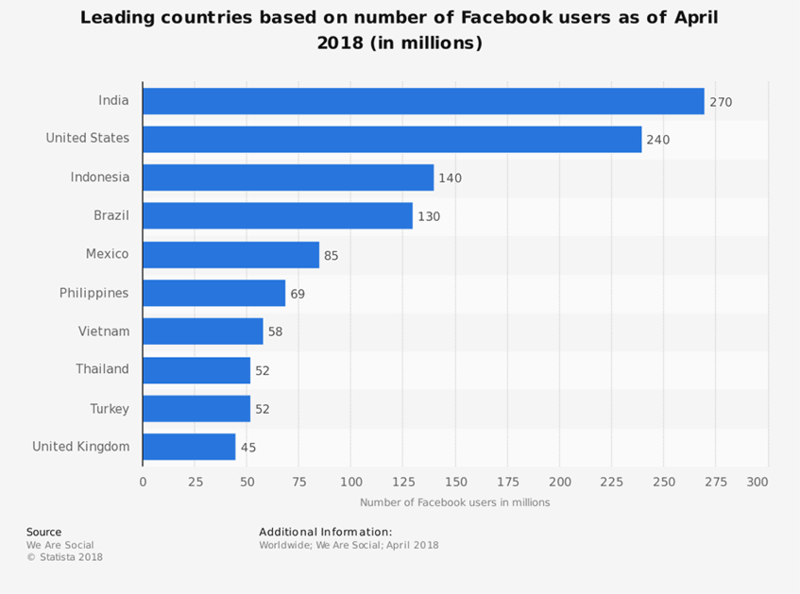 The statistics below shows the leading countries based on number of Facebook users as of April 2018. Total number of monthly active users of Twitter are 330 million. On an average 46% of Twitter users access their account daily. 80% of twitter users access the platform via mobile phones. Roughly 500 million tweets are sent per day. Tweets with video gets6 times as many retweets when compared to the tweets with photos. 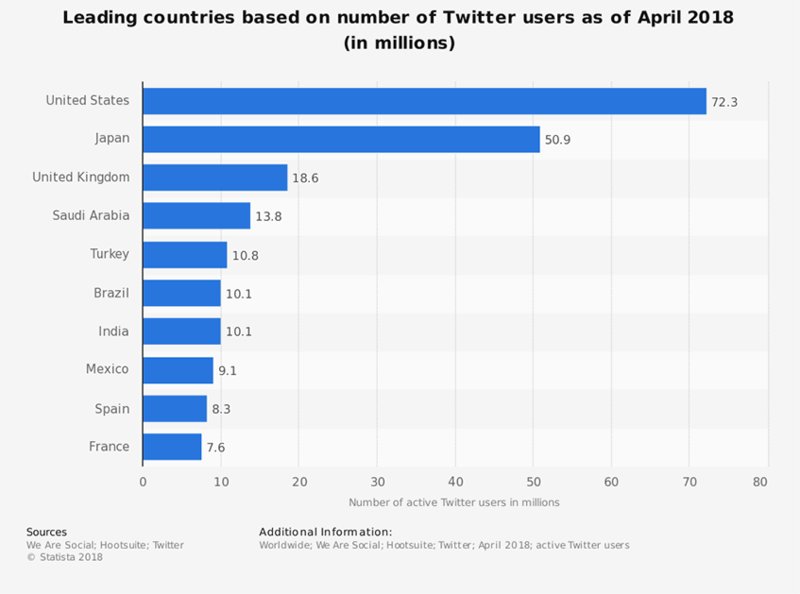 The statistics below shows the leading countries based on number of Twitter users as of April 2018. These are the stats of popular social media platforms Facebook and Twitter to help you strategize your social media marketing tricks on these platforms.